Fed up of paying through the roof for hotels? Check out these 62 industry tips guaranteed to save you money on your next trip! Do you feel your entire vacation budget gets swallowed by hotels? Does everyone else seem to find great deals but you? Read on for 62 hotel industry gems, guaranteed to save you money on your next trip! 1) Figure out what you want. Don’t pay for a swish reception and room service if you just want a room. Don’t go 4 star if 2 star facilities fulfill your needs. 2) Steer clear of half/full board hotels – they’re rarely cost effective, you’ll be better off finding your own meals. 3) Consider chain hotels. Their rooms are often the same price irrespective of size, a great budget choice for families. 4) Seek out suite hotels: their rates are lower and the kitchen facilities will cut down costs on eating out. 5) Look for small hotels and B & B’s: they pay less taxes so you pay less for your room. 6) Hunt out family-run establishments: they genuinely care about their good name so will be less likely to take you for a ride. 7) Consider “pod/micro hotels” for budget trips and airport layovers. A compact solution halfway between a hotel and a hostel. 8 ) Stay outside of city centers – and if the saving’s big enough hire a car with the spare cash. 9) Don’t dismiss the hotel touts who meet you off the train/bus – you may find some hotel gems that charge less as they’re simply not in the guidebook. 10) Ask around for recommendations – you can’t beat word of mouth, it’s often the best way to find the best value options. 11) Get online: social media sites, review sites and forums are great ways to get recommendations find the best deals and find out about real-life experiences. 12) Use price comparison sites to find the best deals online. 13) Seek out 3 for 2 night deals advertised in the press/online. 14) Stay in a business hotel off peak (Summer months and weekends) and get a room for a fraction of the usual price. 15) Ask your favorite hotel to keep you updated on deals and discounts as they come up. 16) Book last minute: you may get as much as 50% off. 17) Don’t dismiss package deals: all in flights and hotel arrangements can still save you money. 18) Shop around: check the price with at least 5 different sources and never go with the first quote you get. 19) Find a great deal online, call the hotel and ask them to match it: it’s preferable for them to do the deal directly and cut out their commission fee to the agent (can be as much as 30%). 20) Search online for discount coupon codes that will save you money when booking online. 21) Haggle hard in low season: tell the hotel your upper limit and they might just match it. 22) Ask for a discount when paying cash: again preferable for the hotel who gets out of having to pay commission to the credit card company. 23) Mix business and pleasure: see what deals you can get for hotels where you’ve organized conferences/meetings/business trips. 24) Ask for discounts when traveling in a group: you’re buying in bulk so should get a better rate. 25) Ask for a discount for longer stays: longer than 3 nights and you’re well within your right to ask for a special deal on the price. 26) Get an International Hostel Card: a sensible move for long-term travelers, the card will pay itself off in little under a week. 27) Get an ISIC card: students, under 26s and teachers get great discounts on hotels and attractions across the world. 28) Ask about standing discounts for the armed forces/professional organizations – you don’t want to miss out on perks that you’re entitled to! 29) Check for shows and large-scale events taking place in the area – the rates will shoot up so you’ll be better off to alter your dates. 31) Put more people in a room: a double with 2 extra beds will cost you less than 2 doubles. 32) Research room rates: twins or showers may be cheaper but you won’t know if you don’t ask. 33) Opt for a shared bathroom: many hotels have basic rooms that they won’t tell you about unless you ask. Sharing a bathroom will lead a nice saving on your room. 34) If you want the cheapest room, say so. That’s exactly what you will get. 35) Check the room rate for each night of your stay and switch hotels mid-way if there’s a big saving to be made. 36) Keep checking the room-rate even after you’ve made a booking. If it drops call the hotel and let them know, they certainly won’t call you to tell you. 37) Avoid room-finding services when booking on the road. They only deal with expensive rooms and also charge a fee. 38) Check the hotel’s cancellation policy. If you need to cancel give them the notice they specified otherwise you’ll get charged. 39) Re-confirm your booking 2 days in advance: mistakes happen and can end up costing you money. 40) Ask about extra charges upfront: it helps to know what you’re paying for. 42) Don’t pay hotel parking fees: park on the street or in a local garage. 43) Don’t pay for wi-fi: stay somewhere that doesn’t charge or go surf for free in the local library. 44) Don’t pay for laundry: take your clothes to the local Laundromat or hand wash them in the sink. 45) Pretend the mini-bar isn’t there! 46) Don’t change-up money in hotels. 47) Don’t buy souvenirs in hotel gift shops. 48) Travel with a partner: singles can cost more than doubles! 49) Join hotel loyalty schemes: rewards include free nights, upgrades and special treatment! 50) Stick with the same hotel chain: again, loyalty saves you money. 51) Check in later and ask for upgrade: your odds will be better later in the day. 52) Broadcast special occasions: birthdays, anniversaries, engagements – all great reasons to get upgraded and treated like a VIP. 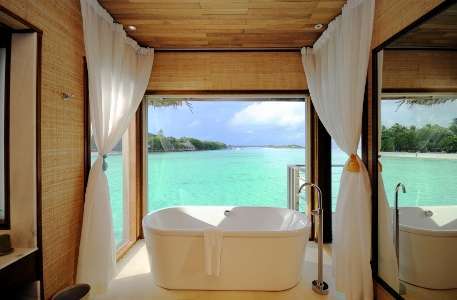 53) If you’re not satisfied, say so – good hotels will make an effort to make you happy. 54) Get to know the staff – they’ll be more likely to knock off charges and throw in freebies. 55) Ask for something in return if you brought a hotel substantial business. Don’t be shy! 56) Travel overnight to save on a night’s accommodation. 57) Rent a vacation villa: great for families and large groups. 58) Do a house swap: live in comfort and pay nothing! 59) Camp: not for inner-city stays but reputable, well-run campsites are perfect for outdoorsy, budget travelers. 60) WWOOF it! Willing Workers on Organic Farms offer full board and lodging in exchange for a full day’s work in dozens of countries across the world. 61) Couch-surf: a trend that’s spreading fast. Find a couch, stay for free and make new friends all over the world. 62) Look up old friends and acquaintances – be bolshy and see if you can bag yourself a free room.